Orange Pecan Waffles are Belgian waffles flavored with orange juice, zest and pecans. Breakfast was never so much fun. It’s nice to have good friends to vacation with occasionally. But if you’re married, finding “couple” friends is challenging considering all the relationships that have to go well. Throw in children of different ages and things get really complicated. Spending 24 hours a day together can bring up a lot of issues regarding food, activities, lodging and money to say nothing of the eccentricities most of us I try to hide from polite company. When our kids were growing up, we went camping at least once or twice a year with Steve and Joan. In the beginning, we both had tents. Then they got a pop-up camper. Next, an RV, then a bigger RV. Along the way, we brought the “banana boat” to the party. All our kids learned to ski and knee board behind that old yellow boat. Meanwhile, back at camp we cooked, ate, and talked about the next time we would eat. Many traditions evolved through the years. For example, we rewarded ourselves with homemade ice cream after setting up camp–usually on Friday night. Another was Joan’s Orange Pecan Waffles, always prepared one morning for breakfast. Part of the fun was making them with Joan’s Belgian waffle iron seen below. Instead of using electricity, it is heated directly over a burner or campfire. These are not fussy waffles. No separating eggs or folding in the whites. Joan assembled the dry ingredients at home and combined them with the liquids right before cooking them at camp. I bought a manual waffle iron for myself but don’t use it much because it requires constant attention–something I can only manage when I’m away from home. As you probably can guess, the waffles pictured here are made with an electric waffle iron. This recipe produces thick Belgian waffles with a rather dense, muffin-like texture. In fact, leftovers make great snacks later in the day. Delicious served with whipped cream, creme fraiche, Greek yogurt, fruit, maple syrup or a generous dusting of powdered sugar. Whisk or sift together flour, baking powder, salt and sugar in a large bowl. 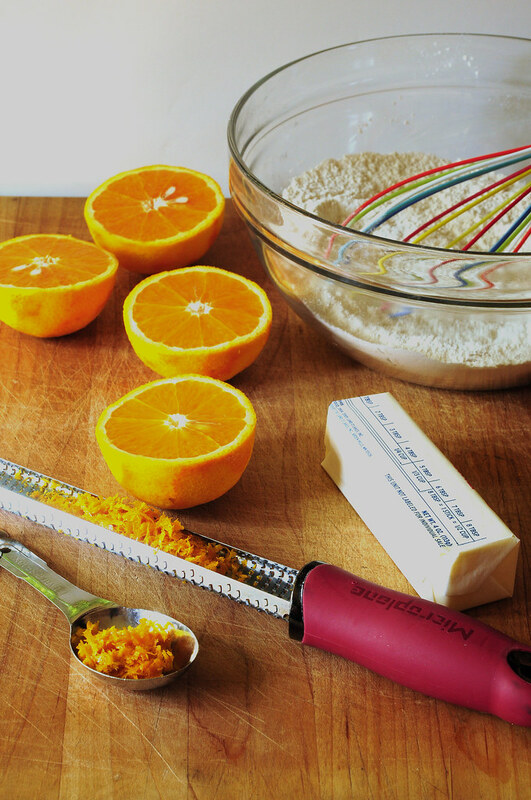 Add eggs, vanilla, orange juice, rind and butter to flour mixture. Stir with a spoon just until mixed. Carefully fold in pecans. Cook on preheated waffle iron according to manufacturer's instructions. 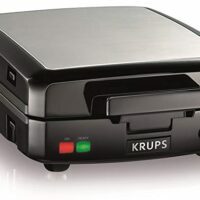 I have looked everywhere for a waffle maker that can make the belgian heart shaped waffles (the rounder heart shape, not the connected, straight on the side versions) and have had no luck. Can anyone help me find the waffle maker she used in this recipe? I featured your recipe on my blog today. Whaat? These look so good. Definitely going to make them soon. The orange is what really caught my eye. Thanks for sharing! oh wow–could these BE any cuter? and they look delicious too! Those sound really amazing! And the pictures are drool-worthy. It IS hard to make ‘couple friends’, even before marriage (at least for me). 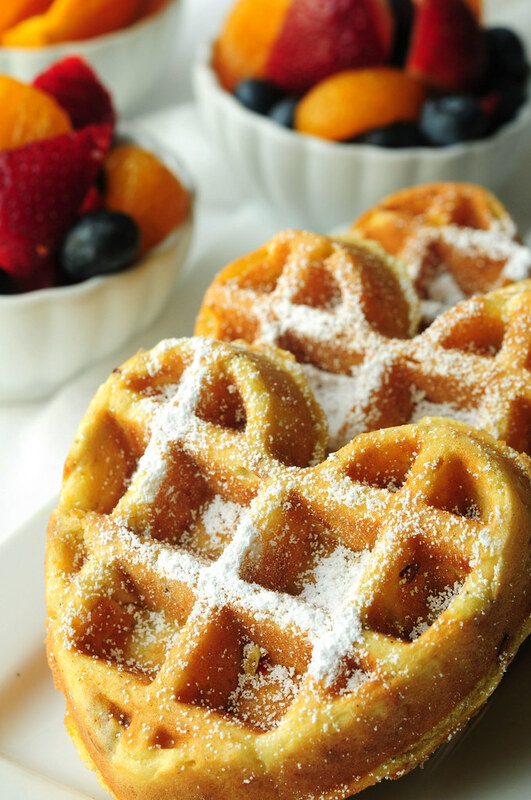 Heart shaped waffles. How cute. And they sound so delicious. What fabulous memories you must share. I have a waffle iron just like Joan’s that I use both when camping and in the kitchen. I would love to have a cute heart shaped one like you have. The waffle recipe sounds delicious. I love your photos. sounds heaps better than the camping trips my folks took my brother and me on! they sure never made us such yummy-looking waffles! These look AMAZING! My husband adores waffles-I am more of a pancake person. These might get me off the fence. I am bookmarking the orange iced yeast rolls-those look SO good! wow! what a delicious recipe site! thanx 4 sharing! Always on the lookout for non-fussy waffle recipes! These look delicious! Lovely post about good friends. We can relate – lucky indeed to have those friends who survive the years and the kids and all the changes. The couple we have travelled with are named Jan and Rob. We have gotten sunburned at the beach, short of breath in the mountains and even camped – but only once! Great post and pics! These sound delicious! I can’t wait to make them, granted it won’t be over a campfire but I’m sure it will still be just as tasty! Waffles are a delightful breakfast, brunch or dinner selection, and orange pecan waffles all the more festive, with very little more work. Oh these look so good. The combination of orange and pecans sound delish! It is a must try recipe. We just got back from a vacation with another couple and their kids. It went fairly well, but I bet it would have gone better if we’d had some of these waffles! Wow, what delicious-looking waffles! I want a bite! ahem…. 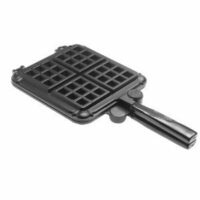 I have been looking for a waffle maker (why are the so darn expensive)? But have seen this heart one – it’s wonderful! It’s the photo though – that’s stunning! TM is a favorite haunt of my mom’s… I’ll have her check there for me! Great post – great memories – great waffles! These look delicious! 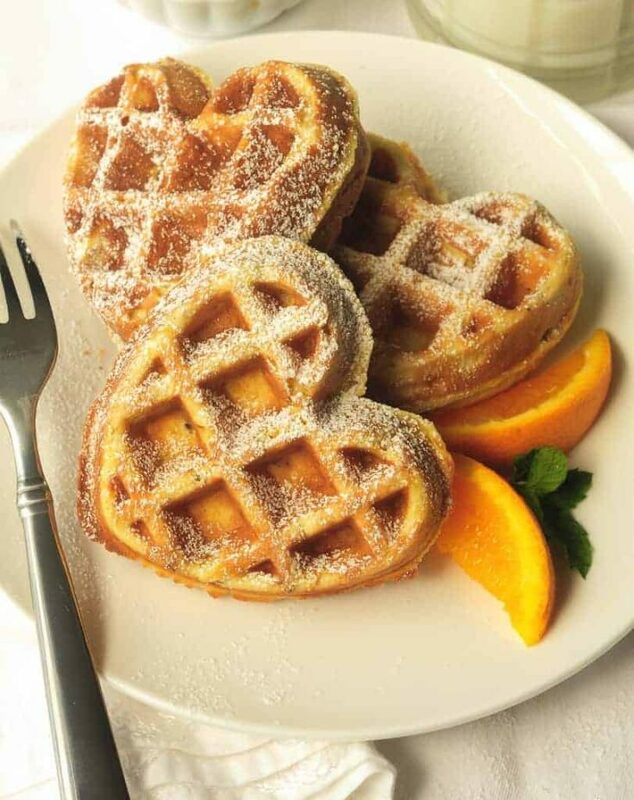 I love the heart-shaped waffles, great idea. What is the cute heart shaped waffle iron you used? Too cute, I want one. The waffle iron is by VillaWare. Got it at Tuesday Morning in the last year. Probably available on the internet too. these are oh-so very cute! I am coveting your heart shaped waffle iron! Those sound delicious! I love waffles and these look great. I am sure mine would not turn out so well but we can always hope…Have not seen the electic waffle iron that makes heart shaped waffles. How fun!! I know these must taste wonderful not to mention the heart shape that means made with love. Awsome. Have a great trip next month. Let’s hope it’s cooled off by then. Good memories of Rhodes/Hastings camping trips! Speaking of, maybe we’ll all plan to go camping together again someday. As for the waffles, I bet your favorite grandson would enjoy these! haven’t heard about where you are vacationing to this year…..sounds fun! I don’t think our camping waffles ever looked that pretty. However, how would we know, they were eaten as fast as we took them out of the waffle iron! What a lovely tribute to your friends–you’re lucky to have each other. I’d never heard of a campfire waffle iron; that’s genius!